Stay warm and cozy under the Premium Reversible Berber and Sculpted Velvet Plush Luxury Bed Blanket. 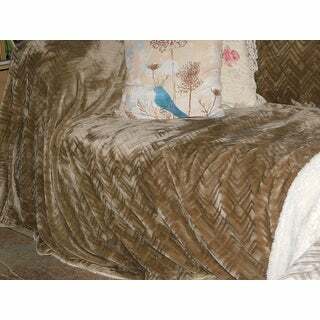 The beautiful, rich, velvet plush side reverses to toasty Berber for the ultimate in elegance and comfort. This blanket is designed to fit beds of any size, and is available in a variety of rich, vibrant colors and prints. It's machine washable and pill resistant for long lasting use and enjoyment. Beautiful, plush & medium weight! I purchased this blanket in the surf blue-beautiful, very plush, design is pretty! One thing I will note which I found a plush as the blanket wasn't a light weight more medium and very soft! I purchased in full/queen and it really fit my high (20") full sized bed in guest room. Hubby and I liked so well, I purchased it in King sized for our oversized (high) queen bed! Haven't had to wash yet so can't say about what it will be like but blue surf color is beautiful and blanket design enhances it! I love everything about this blanket! The design on the velvet side is something that you don't see every day. I bought two of them and the blue is absolutely a beautiful color of blue and I bought another in the cream color and they are both beautiful and toasty warm. So far they have done well in the washing machine and dryer and for the price I couldn't be happier. This blanket is lightweight, super soft, warm without being hot, reversible, machine washable and so cozy as to be luxurious. Highly recommend this product. I love it! It's premium, compared to what you find in the stores now days, well worth what I paid for it, glad I found what I was looking for. 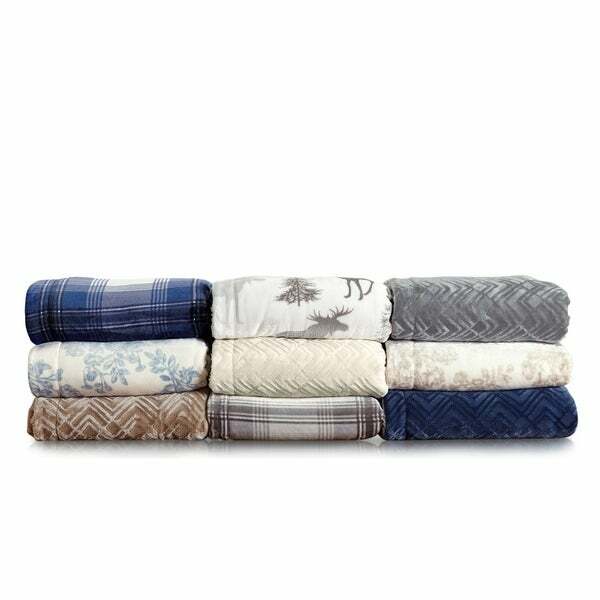 I have bought a similar product in the past and it doesn't compare to this one, I bought two they are so nice, They have a double layer so there is no cool air that can get through the fibers in this blanket. It's a must that I am warm and this beautiful blanket meets my expectations 100%. It is washable and dries with absolutely no fibers left in the dryer screen, Absolutely the Perfect blanket for those cold winter months. I bought this in twin size to use as a throw when watching TV. I love this blanket as it is exceptionally warm because it's actually two blankets sewn together. Both sides are really cozy. My only concern is that it's really to big to use as a throw, but I'm going to cut it down about 8 inches, which will make it perfect. This blanket is not only gorgeous but so soft! Either side usable. The first night using it was wonderful. It really helped retain warmth and was perfect since the night turned a bit chilly. This is th bst blanke I ever bought! I use it summer and winter, It washes up nicely, the plush side stays full and does not pill up, The sides are sewn together so there is no slipping. I simply adore this blanket!! 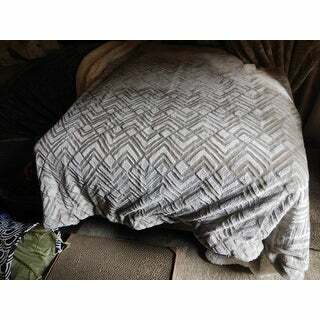 A while back, I had ordered this blanket, queen size, in taupe color; I wanted a twin size one, in the same color, taupe; I received it, however, it is much lighter in color than the previous one I bought as you can see in the photos, below; I'm keeping it, though, and eventually, hope to get a queen size in taupe, this time, hopefully, the color will be the same. It is a beautiful blanket, though, so soft, nice looking fabric and washes great. This blanket is the best you could hope for. I was looking for this type of blanket for a while and I finally found exactly the one I wanted. I read the reviews on some of the other brands which stated the seams were not all sewn together and only the ends were sewn, which caused material issues, obviously! This blanket is definitely perfectly sewn together on all seams and it is also so pretty, soft and very warm. My daughter fell asleep on my bed and did not want to leave unless she could take my blanket and that was not going to happen...I just placed another order for my daughter's new blanket! Don't hesitate to buy this one, its getting cold where I am but I will be super warm. This is an amazingly soft blanket. . . So soft that my children keep trying to keep it. It's a little thick to have under a coverlet and I bought it in a king size (so too big for a throw), but I love it and the aqua color so much that I don't want to return it -- it's amazing. One of the softest blanket s I've ever had,the only thing issue I have is how it was packaged;my ivory ended up with ugly smuges where it must have gotten wet and the wrapping bled on it. Love the softness and it is very warm. This is a super soft blanket that I bought for my daughter. She sleeps with it on her bed every night and absolutely loves it. It has held up to many washes so the quality is good. This blanket is so soft and luxurious, I feel like I am wrapped in heaven all night! It is surprisingly warm and lightweight. I love it so much I got one for the guest room too. Favorite cuddle up blanket for TV watching. Two for the guest room and one for the living room. Launders well, but does 'pill' a bit as expected. Happy purchase. The BEST purchase ever! Nice and warm. Feels good and cozy. I'll likely purchase a couple more. This blanket is lovely! It’s very pretty, soft and comfy. I put this on our guest bed and have received compliments. I am ordering a second one for movie nights! My absolute favorite blanket. Soft and cozy. I bought the blue voile with white background queen size blanket for my double bed. What I especially love is that it brightens my bedroom which tends to be a bit dark. The blanket is so soft and pretty. I have other throws that are made in a similar manner - they are always so wonderfully SOFT and very warm too. This blanket is perfect for the winter cold. I am so happy I found this particular design to make my bedroom more cheerful. It arrived in great shape. I washed and dried it before using - there's no lint problem at all. "what color is "blue surf"? is it page 6 in the photos?" Yes, the 6th picture is blue surf. "is Winter White = ivory or is it true white (like a piece of paper)"
Brooke, the blanket is ivory. "Is the taupe really a taupe color - which means it would be a cool brown with a touch of gray? The color on my monitor appears warm brown." It's warmer. More brown than gray. "What are the dimensions of the king sized blanket?" yes This blanket is all sewn together as one piece. No slipping. This blanket is simply the best! "Are both sides of this blanket sewn together and affixed not only on the edges but throughout the entire blanket so that one side does not slip away from the other side? I had a similar blanket that was sewn on the edges only and it would not hang evenly over my bed. Please advise!" This blanket is all sewn together as one piece. No slipping. This blanket is simply the best! I haven't had a problem with the blanket slipping in this manner. I actually bought a bigger size and use it over my leather couch that has a fairly high back as a cover. Then I can pull it over and completely wrap myself in it and also keep the leather from getting scratched. It is super comfy! I don't know but it doesn't appear to be available. "What is the weight of the Full/Queen size blanket?" I don't know for sure but it is not as heavy as some I have had. I guess you could say it is just average weight-- not too light and not that heavy either.